Its such an amazing quality and it fits like a glove! The Owner of this shop was very pleasant as well and kept me in touch with everything, if I had a problem she was sure to get back to me right away and find a solution. I absolutely love it and hope to buy more from her. This is my second purchase from this shop and again I am very happy. The gloves came out even better than I imagined and the artist is so inventive in executing an idea. Welcome to Black Sheep Latex! We take great care and enjoyment making every order and would love to hear your ideas for changing and customising my existing garments to your own specifications, so please don't hesitate to ask about adapting any of our listings. Each garment is fully chlorinated before shipping unless otherwise stated. This means that dressing is made a lot easier and there is usually no need for messy lubricants or talcum powder. The outside of the garment is usually made shinier by this process too, but additional shiners and polishes can still be used. Our general lead time is 2-3 weeks but if you need something quicker just let us know and we will do our best to fill your requirements. We only replace items if they are defective or damaged. If you need to exchange it for the same item, send us an email at blacksheeplatex [!at] gmail.com and send your item to: Black Sheep Latex, 53 Caistor Road, Laceby, Lincolnshire, DN37 7JA. If you are shipping an item over £50, you should consider using a trackable shipping service or purchasing shipping insurance. We cannot guarantee that we will receive your returned item. Payment is accepted via Paypal, and is expected at the time of purchase. Unpaid orders will be cancelled after 2 days if the buyer doesnt contact us first. If you have problems with your payment pop us an email and we'll do our best to work something out. The current lead time is posted in the shop announcement. 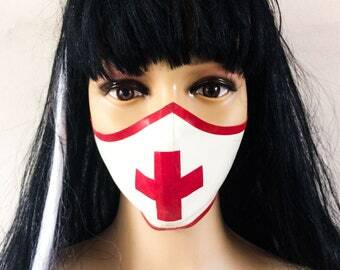 Sometimes a particular colour of latex may be out of stock and we will let you know straight away if this is the case and it is likely to affect the shipping time. Your garment will be packaged in tissue paper and sent in a padded Jiffy envelope. We would advise that if your parcel arrives damaged that you do not accept the delivery, otherwise only you could make a claim for compensation yourself. Parcels are sent by Royal Mail 1st Class Recorded delivery - these usually arrive within 1-2 days of posting. Parcels are sent by Airsure which can be tracked (depending on the country) and should arrive 7-10 days after posting, although I find it may take a few days longer, especially if they get held up through customs. Please note that we cannot be held responsible for postal service delays or any additional customs charges. Black Sheep Latex would love you to be happy with your purchase. If you have any issues with your garment please don't hesitate to contact us so that we can sort things out. Please take care when taking your own measurements, we would recommend you ask someone else to measure you as your own movements may mean you take inaccurate sizes. Each garment is handmade and may differ slightly to the photograph as the patterns are adapted to each individual order. Please read the latex care advice on this page as latex is a delicate material and problems can be avoided with the correct handling and washing. If you have any problems with damage please contact me, preferably with a photo so that we can see how to resolve it. If it is an issue with workmanship we will repair the item free of charge, however if the damage has been caused by improper handling, ie. tearing or accidental damage, the garment can usually be repaired for a small fee. 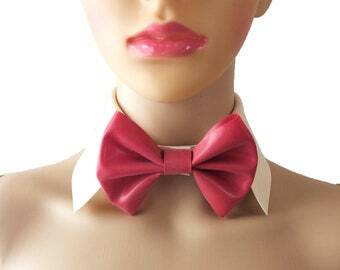 Latex should be cleaned after being worn by rinsing inside and out with luke warm water. It should be dried flat or on a wooden or plastic hanger before storing in a plastic bag or tissue paper. Your latex should be stored away from heat, humidity and light so as not to affect the finish and shine. Please be gentle when pulling your garment on and off as latex is fragile and too much stretching may result in a rip. Be extra careful to remove any jewellery before dressing as any edges such as rings or fingernails can cause a tear in the material. Light coloured latex can be stained by certain types of metal so be careful not to handle coins or wear piercings that are in contact with your garment otherwise a permanent yellow stain may occur. Perfumes and oil based lotions may also chemically affect the latex finish. 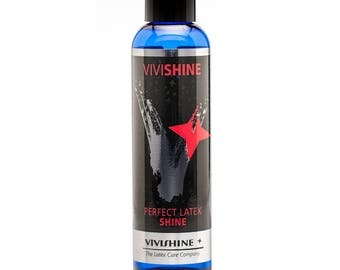 Latex can be polished to a high shine using silicon based sprays or wipes, I would recommend Armorall or Vivishine.